Introduction Despite the strong records of safety and quality maternity care, Australia rural communities have experienced an on-going loss of services for more than a decade, forcing thousands of women in rural and remote areas to leave their community and familiar places to distant centres to give birth. The loss of these services has raised some problems for rural communities such as poorer health outcomes for mothers and babies, family disruption, travel costs, and the risks of roadside birthing. Aims The aims of the study were to identify maternal needs of women in rural and remote areas and to examine the current policy and maternity care services in Tasmania for improving rural maternity services. Methods Mixed methods of quantitative and qualitative were employed using questionnaires and interviews. Of the 600 survey questionnaires posted to 6 Tasmanian rural communities, 210 questionnaires were returned. Semi-structured interviews were conducted with 22 women and 14 health professionals. SPSS v.18 was used to analyze quantitative data and NVivo v.8 was used to analyze qualitative data. Results and Discussion Quantitative data analysis indicated that women in rural areas have limited access and choices during their pregnancy such as location for antenatal check-ups, preferred health professionals, location to give birth, and transport. Conventional model of care (50%) was the most preferable choice, followed by midwife-led model of care (40%) and planned home birth model (9%). These findings were supported by qualitative data. Insights gained from the data revealed maternal needs for women in rural areas including access, safety, available small rural birthing services, support information, and quality services. Respondents strongly wished for reopening local birthing units in Tasmania for the continuity of care, growth and sustainability of rural communities. 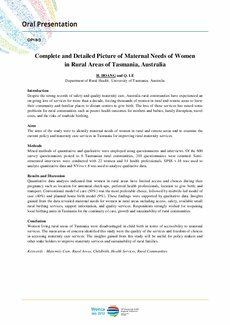 Conclusion Women living rural areas of Tasmania were disadvantaged in child birth in terms of accessibility to maternal services. The main areas of concern identified this study were the quality of the services and freedom of choices in accessing maternity care services. The insights gained from this study will be useful for policy makers and other stake holders to improve maternity services and sustainability of rural families.